Tron High Tea: What Would A Computer Program Eat? What a do a cheeseburger and onion rings have in common with a malicious computer? After trying the limited-time Tron-themed menu at Royal/T, I still don't know. I also don't care. Like a desperate fashionista willing to pay more for a plain t-shirt with a designer label, slap the word "Tron" onto something, and I'm there. You don't have to time-warp into the future or assimilate into a computer program to get sucked into the marketing juggernaut for Disney's upcoming Tron remake. Just drive to Culver City, where Japanese maid cafe Royal/T has, with much fanfare, converted a sector of its floor-space into a Tron pop-up store while the cafe is serving a special Tron-themed menu for a limited time. 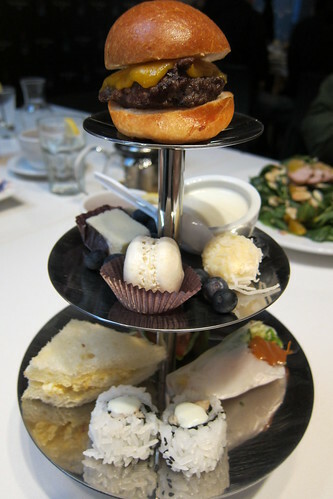 The essential "Tron-ness" of the Reco Burger (a buffalo burger with chipotle aioli and onion rings; $12), the Tron Legacy High Tea (three tiers of dainty finger foods and desserts topped with a slider; $25) and really everything on the Tron menu is questionable. The Lightcycle Salad doesn't launch you across a neon grid on a futuristic motorbike. You don't get de-rezed when you finish your Identity Disk Cake. Then again, what food would achieve those feats? 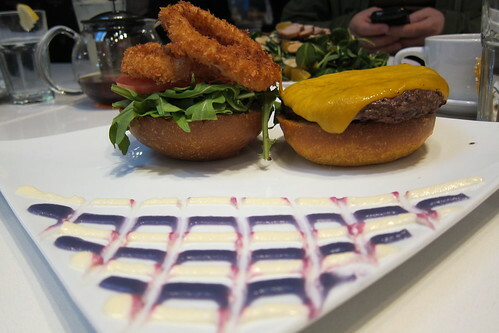 Perhaps a menu based on a movie like Tron calls for the wizardry of a chef like Grant Achatz, not for a cheeseburger next to a grid of purple mayo (as compelling as the decorative mayo was). The highlight of my lunch was spotting creator of the original Tron, Steve Lisberger, ambling through Royal/T. That made it all worthwhile. 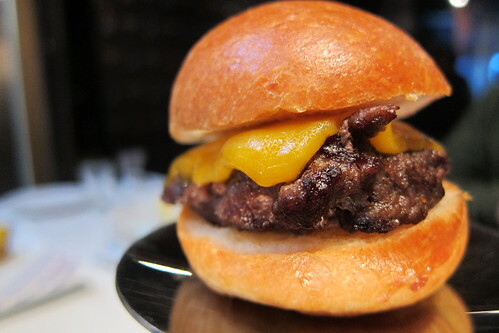 Tron Legacy High Tea: the slider on top. 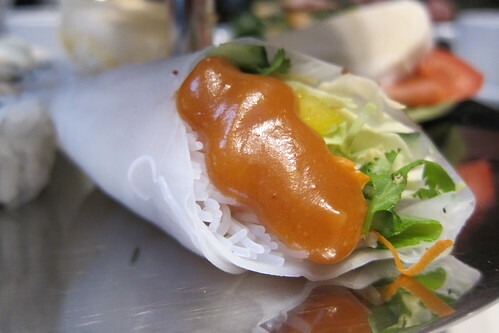 Tron Legacy High Tea: veggie spring roll. 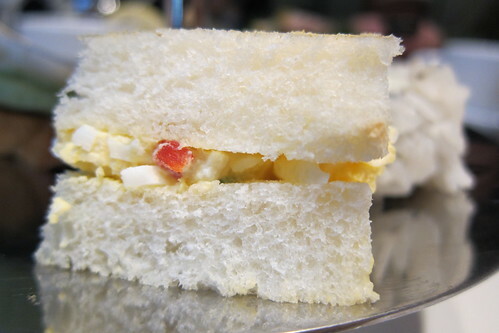 Tron Legacy High Tea: egg salad sandwich. 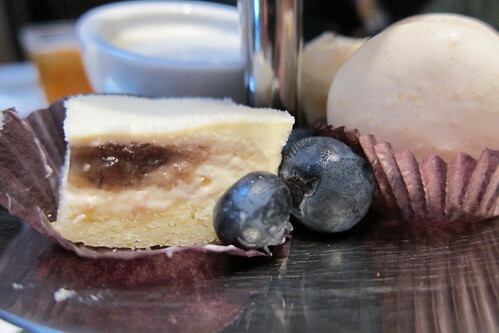 Tron Legacy High Tea: dessert finger sandwich. 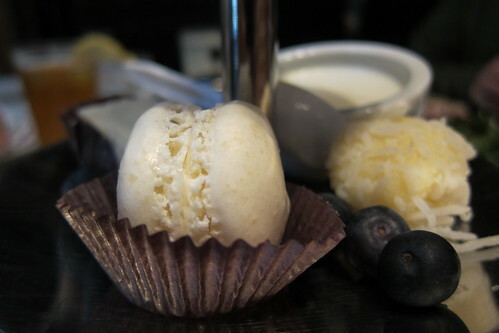 Tron Legacy High Tea: coconut macaron.